an artwork collaborative featuring Neko, Chandu Reading, Thatkidpeep, Persue, Sergio Hernandez, C. Liu, Bobby Salzano, Brent Sandor, Kevin Peterson, and Monica Hoover. The term "struggling" has invariably been applied to artists in order to define the career as one that does not rely on constant employment or guaranteed paychecks in the process of creating inspiring and original work. As the art gallery scene and artist's network slowly grows in the largest city south of Los Angeles and Orange County, many artists here in San Diego can attest to the difficulty that comes with having a creative occupation. Whether it is finding paying work in their field of expertise or just gaining recognition within the exclusive art world, many artists in San Diego are dedicated to enduring the guff and looking past the doubtful in an effort to produce unique, thought-provoking art and add to the culture of Southern California. As one of the curators of VOICE 1156, Neko Burke is supportive of the gallery's aim to promote innovative fine art and expand the San Diego arts community. Having participated in many local collaborative exhibitions, Neko has come to realize that drawing crowds and attention to art shows is no easy feat. Though some local artists may be discouraged by a lack of recognition or appreciation of art gallery exhibitions here in San Diego, many have chosen to take the difficulties in stride and use these hardships as a driving source of inspiration. "LIFE IS HARD BUT... 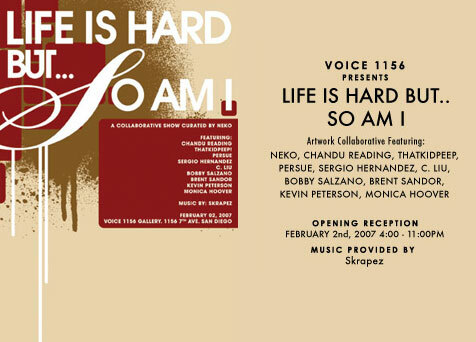 SO AM I" showcases the collaborative work of Neko and various artists he believes to be among the best of San Diego. As the title implies, the featured artists endure the sacrifices required to dedicate themselves to their craft. In addition, the collaborative process of creating the artwork on display was documented on video and will be projected at the February 2nd opening to give viewers a behind-the-scenes take on how the artists execute their work single-handedly and in unison.